This is one of the most distinctive olive oils produced anywhere. The fact that its origin is Sicily only adds more excitement and interest. 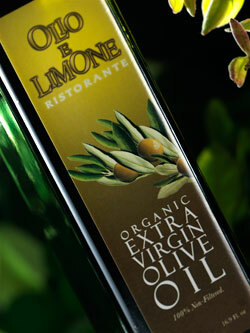 Olio e Limone Ristorante Organic Extra Virgin Olive oil blends three local olive varieties picked by hand from 100-year old trees-Nocellara (a slightly fruity eating olive), Cerasuola (a full-bodied and light green olive) and Biancolilla (for distinctive color and fruity fragrance). The color is green with yellowish tints and it is has a lightly spicy olive, almond and green tomato flavor. This organic extra virgin olive oil is ideally suited for drizzling over greens or a caprese salad, or for sautéing fish or meats. Finish each dish with a swirl of the fragrant olive oil. High quality organic olives, cold-pressed, unfiltered, fruity, medium-bodied with distinct peppery finish and velvety golden color. We have a minimum order of 6 bottles and only ship in increments of 6 bottles (6, 12, 18, etc.). If you would like to place an order, please fill out the following form or call 805.899.2699. We will then obtain credit card information via phone to complete the purchasing and shipping process.